Ever tried to entice a tortoise out of its shell? Picked a fight with an endangered species like a snow leopard or a white tiger? Do you know how many rocket-propelled grenades it takes to kill a rhino? Have you ever dared tangle with a honey badger? 4. No. Are you out of your tiny mind? Those things are vicious! Players will do all of this and more in Far Cry 4. Ubisoft's open-world shooter boasts the usual aspects players expect from an FPS – a plot, colourful characters, a denouement of sorts – but its principle draw is the fact that players can ignore the narrative whenever they choose. Given the size and scope of Far Cry 4, this is bound to happen a lot. The reason for this is that Ubisoft has gone to great lengths to make Kyrat – the fictional country in which Far Cry 4 is set – feel like a living, breathing environment, as harsh as it is beautiful. The developers also wanted to make the player feel completely like a fish-out-of-water and this is what prompted the game's narrative developer to head out the country Kyrat is based on – Nepal – and take a trip off the beaten path. "Far Cry 4's developers are pushing the new-gen hardware right to the edge"
"Kyrat was the first character we designed in the game," says Mark Thompson, Far Cry 4's Narrative Lead Designer. "We started to build it based on research on Nepal – we wanted it set in the Himalayas so we could move away from [Far Cry 3's setting in] tropical islands." "So one of the first things we did was we synched up with the guys from Vice [Magazine] and they're really good at guerilla-making travel guides. We were very inspired by their videos of Liberia. So they took us on a Vice-inspired itinerary of Nepal." "We wanted to take players outside their comfort zone and so it was important that we as developers knew that terrain." To hear Thompson tell it, the developers dived deep into Nepalese culture to find the basis for the lore and culture of Kyrat. It was important that Far Cry 4's environment remain fictional out of respect for the cultures it was based upon. But they also included some pretty hairy moments from their time on the ground with Vice. "One of the first things that we did was Vice took us to a Hindu temple to witness an animal sacrifice," he says. "It was very shocking to see. It was intense and weird. But I thought about it on reflection and spoke to the family that this happened on behalf of. They were doing it because they wanted to conceive a second child. They then took the animal home and used every part of it for food." "It seems barbaric to Western sensibilities but on reflection it's more respectful to the animal than our sterile farming industry here." "A lot of Far Cry 4 is about immersing the player in a foreign culture and having that culture inform the events in the game." "Players want to play the game their way and have their own fun." Kryat is far larger than any game the Far Cry team has ever worked on before – not just culturally, but in terms of depth and scope. 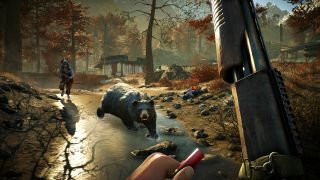 Executive Producer Dan Hay says that the size of Far Cry 4 is wrapped up not just in the scale of its map – although it's larger than the 17 to 18 square kilometers contained in Far Cry – but also in the range of activities that are designed to lead players off the beaten path. "Players who want to just do the main missions can do that," says Hay. "But between two mission points most players will see more content - maybe a herd of animals, or karma mission or a radar tower or a fort they can invade – and then within four hours they will totally have forgotten what mission they were on."